A tough looking cookie bathed in milk chocolate has joined our garage recently. It isn’t one of those delicate French delicacies though, which melt in your mouth, and which, you savour one bite at a time. 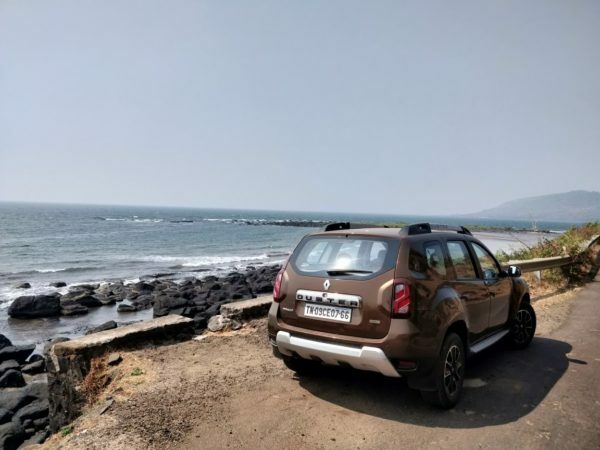 As we found out, the Renault Duster is made out of an iron dough which is kneaded into shape by bare, industrial hands and is baked in an oven where probably the toughest of sweet things puff into readiness. One bite is all it took to realise that even ‘Tough’ can leave the sweetest of tastes in your mouth. Like its name, the Duster radiates a rugged look. It’s flat and squat but tall enough stance makes you believe it is built for the outdoors, and your belief, it keeps. A star highway performer, it has already taken us out on two out of town trips of almost 500 km each and many more within the city, the 6-speed AMT gearbox has been attracting all the well wishes from all our left limbs. Here are some of our observations until now. 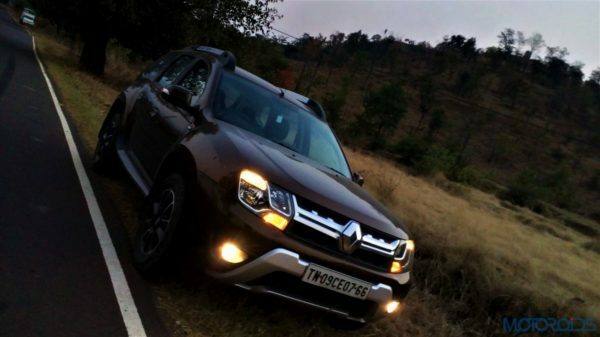 The 110 PS, 1.5-litre diesel engine which powers the Duster is a gem. Unlike its state of tune in the pre-facelift model, its driveability in the bottom-end of the rev range has improved drastically and no longer do you have to wait until the turbo boosts things near the 2k rpm mark. When it does, a sweet and very audible whistle blows out to mark the arrival of a reassuring tug, the Duster moves ahead with a lot of conviction and feels like a properly powered machine to haul its brawny body. The smooth motor can rev all the way till 5000 rpm, its gusto levelling out only after the 4k rpm mark. It’s a suremeley refined motor for the class, and the rewards of the pain that’s gone into its engineering can be reaped inside the cabin where it’s hardly audible at idle. 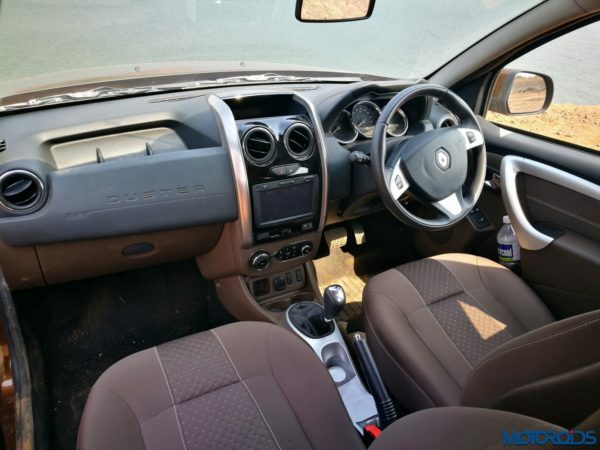 The Duster’s creamy smooth, refined motor is one of the strongest aspects of this rugged machine. In all honesty, at the outset, we didn’t imagine that an AMT system on a toughie like the Duster was the most accomplished of arrangements for an automatic transmission system. However, the apparatus which drives the Duster scores really high on convenience. It gets a ‘Creep’ function too which acts like a blessing when you’re doing nothing but crawling in one of those horrendous Mumbai traffic jams. It’s not a steep learning curve to learn how to make that AMT work smoothly for you, and once you know how to feather that right pedal correctly, the Duster handles the stop-starT city traffic fabulously with it’s smooth gear changes. First timers would obviously experience the much talked about ‘head nod’ associated with AMTs where there’s a lag between switching gears, resulting in momentary deceleration, making the head and torso move gently forward. However, spend a couple of hours with this system, and you’d experience that those ill-famed nods have vanished like magic, and the system spells terrific convenience for the little additional price you pay for it thereon. 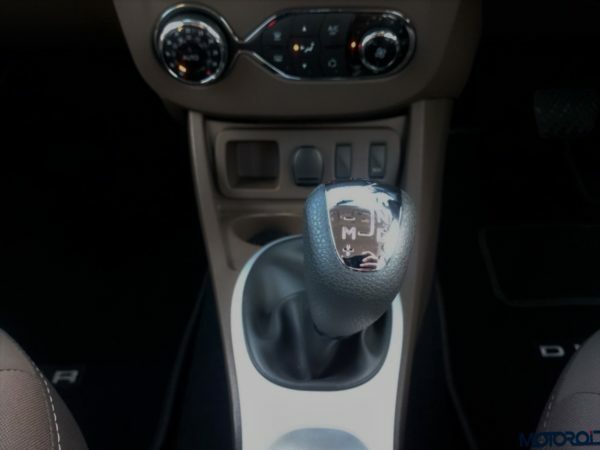 There’s also the ‘Eco’ button, which is placed behind the gear lever in a place which isn’t the most convenient to reach – a thorough testimony to it being a French designed car. 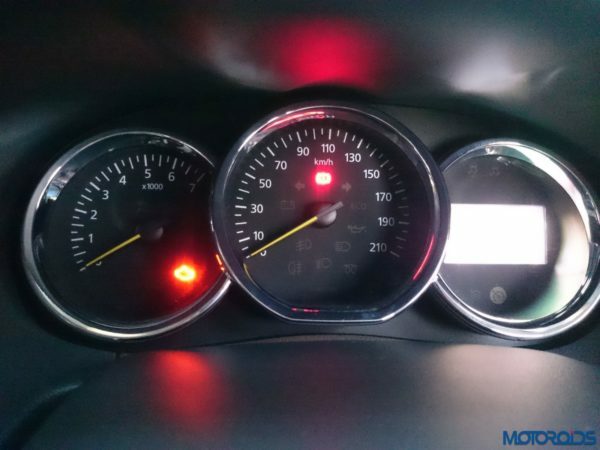 In the Eco mode, the gearbox is eager to upshift into higher gears as quickly as it can and once you’ve learnt how to modulate the throttle while driving an AMT, things remain pretty smooth too. The Eco mode, though, is recommended only when you wish to drive gingerly though. If you’re in a rush, it’s best to stick to ‘Normal’ mode, or better still, push the lever to the left and row the gears yourself. It’s quicker, more fun and you could enjoy the benefits of clutchless convenience with some amount of engagement. On single carriageways, having a good understanding and experience of how that AMT unit works really helps while overtaking. Burying the pedal is not the way to go here, and part throttle works best. Also, the smarter amongst us would rather have the car in the gear they want it to before starting to overtake, than mashing the pedal in the middle of the act, and expecting the inherently slow AMT tech to shift in a blink mid-way. The AMT box downshifts seamlessly though, without any sudden jerks, blipping the throttle to perfection before every gear change. For all those who miss that good-ole, analogue feeling a great steering system transmits to your palms, you’ve got to grab the Duster’s wheel. Although, there’s some amount of judder when you steer it turn-to-turn at a standstill while trying to get out of tight spaces. The same is true while cornering hard, which is also when it develops a strong tendency to return to its neutral position. Also, it’s diameter could’ve been a tad bit shorter and that design seriously needs an upgrade. But you can live with that for how well-weighted and natural it feels otherwise. Oh, and it takes some time to get used to those audio and telephony controls behind it. But once you do, you start appreciating its functionality, until you realise that you can’t operate it with your left hand. If you want to drive an SUV which offers car-like dynamics but rides and flattens everything underneath like the latter, the Duster is where the buck stops even now in this segment. You suddenly forget how to slow down for rough patches, small humps and other such differences in the surface. And the Duster then reminds you, it isn’t a newborn you’ve got to clutch carefully, but a leanly muscled teenager who is astonishingly relentless. This Renault is a straight line dynamite which can eat up miles for meals. Even when you show it some curves, it goes around bends with a positive composure, albeit, with an amount of understeer which is acceptable and understood for a vehicle with such a fantastic ride quality. Manoeuvring the Duster within the town is really easy too, for the turning radius is great, visibility all-around is just that, and unlike some behemoths, it doesn’t have a massive footprint. 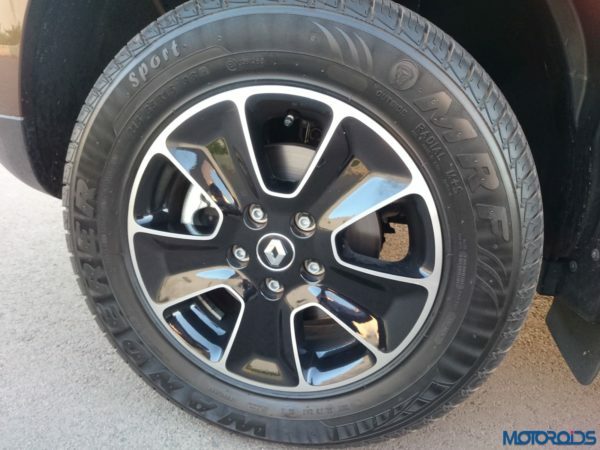 The Duster’s brakes do a fantastic job of hauling down a fast-moving mass of metal from really high to the lowest of speeds. The kit is sharp and the pedal lets you modulate the amount of stopping power required in a gradual manner. There’s no instance when you feel you’ve lost too much momentum or you wish you had more brakes. In addition, the top-spec RXZ variant we have gets electronic nannies like ABS, EBD with brake assist and ESP which never allows any drama to set in. On, and we love those sportily styled black-silver wheels – really add a ton of chnaracter to the machine in profile. Alright, so knee room isn’t what you’d call ‘Grand’, but there’s ample space to keep all sizes comfortable. The seats, on their own, are pretty supportive and there’s a central armrest with cup holders too. 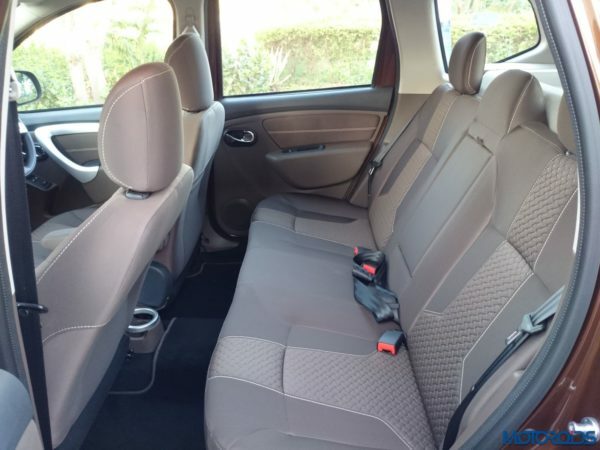 But what really amplifies the comfort quotient many folds for all occupants of the Duster is that fabulous ride quality. It misses out on a rear AC vent for some reason after going through a mid-life upgrade, but the main unit does its job fairly well and the presence of a rear quarter glass keeps things bright and happy. Cruise control? Check. 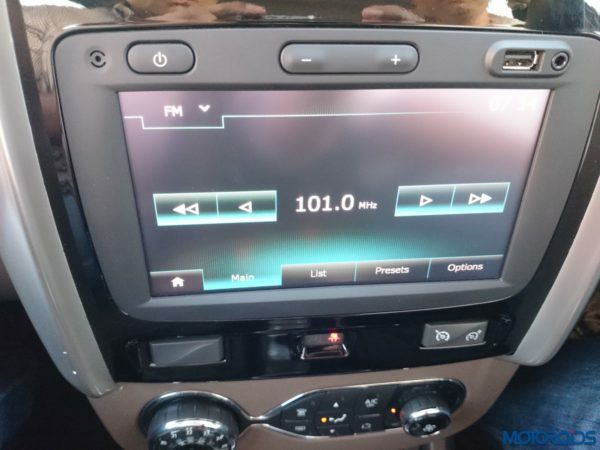 Touchscreen infotainment with in-built navigation? Check. Auto-closing door mirrors? Check. Driver-side armrest? Check? Lots of storage spaces? Check. Connectivity features? Check. Auto Up/Down driver side window? Check. Hydraulic struts for the bonnet? Check. Reversing camera, hill-start assist, rear defogger with wash-n-wipe, LED tail lamps and an exhaustive trip computer? Check. The Duster’s pair of crevices above the centre console and the glovebox spell great convenience for the front seat occupants. These are not symbolic storage spaces which appear to have some space, but can’t hold zilch if your wished to put in anything larger than your slim wallet. Those compartments can swallow a whole bunch of big cellphones, keys, wallets, toll tickets, keys, currency notes – heck, even water bottles. You just don’t have to think before lobbing whatever you have in your hands into one of those openings. Doesn’t sound like much, but spells great convenience during those long journeys, where you don’t have to look for a space after paying money at a toll gate, or after having had a sip from that bottle. Other carmakers can definitely take a leaf from Renault’s book in this department. 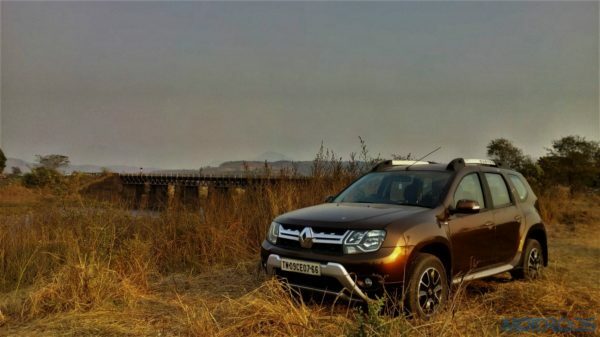 The Duster’s boot capacity of 475 litres is also class-leading and can be a deciding factor if you wish to use it for those getaways with your family. It’s ahead of its rivals by a mile in that department, and can swallow multiple jumbo sized suitcases and more without a burp. Once you’re done admiring the “Come Hammer Me” looks of the Duster, you notice door handles which could have been grab and pull type like most cars. 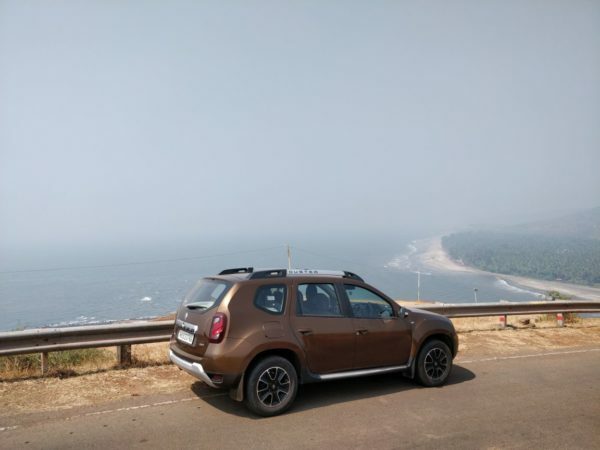 There’s no running away from the fact that for all the mechanical brilliance which works in the Duster’s favour, the cabin isn’t the Duster’s brightest spot. Quality of materials and how all the things inside make you feel isn’t exactly premium. 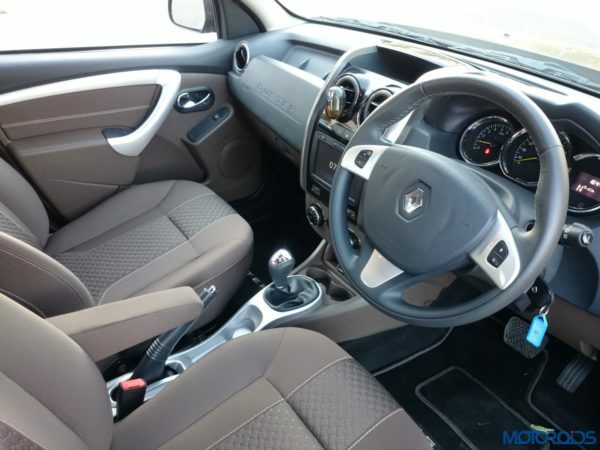 While the Duster is very well equipped, the finish and aesthetics of the cabin could definitely be improved. If your driving style is unhurried, you can live happily with what the AMT system has to offer. No doubt we love it for the convenience. But then, it takes time to read the behaviour of the gearbox, to come to terms with the time it takes for initial gearshifts and the head nods one experiences when you’ve held a particular throttle position. 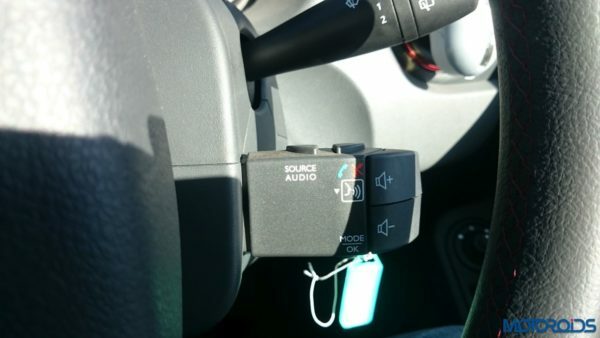 Once you understand how it works, you naturally adjust your driving style to its functionality. And then, there’s always that manual mode when you’re in the mood for some fun. There’s no Dead Pedal, especially in a car which wants your left foot to relax. The resolution on the screen isn’t too great and it’s touch sensitivity is also not very good. 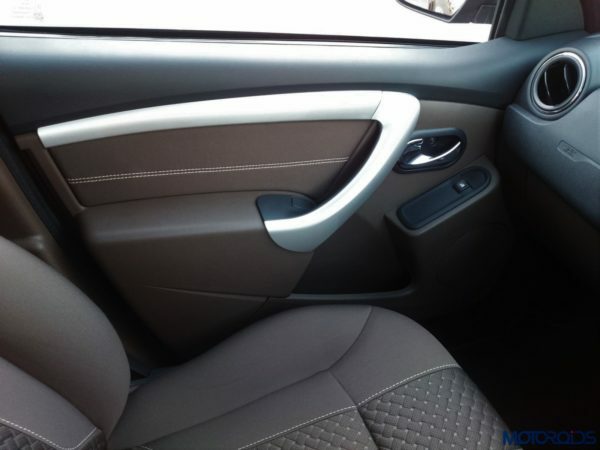 The silver plastic panels on the inner door handles create a springy sound when pressed hard. The driver’s seat very, very mildly rocks on its axis in a damped manner under heavy braking – not sure if it’s something engineered into it to absorb the shock or an genuine issue. There’s not enough space for the driver to slip his had in and adjust seat height with the door shut. Besides this, the Duster has been performing squeak-free until now, although wind noise at high speeds could’ve been better contained. 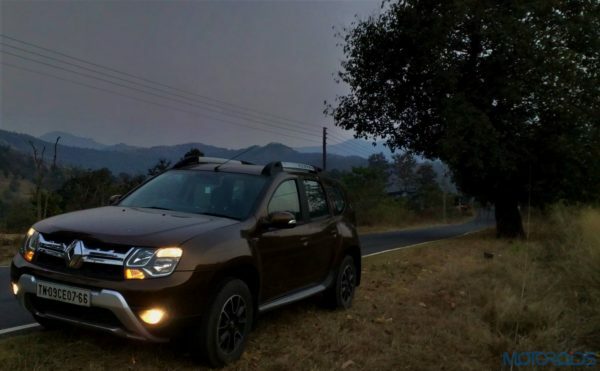 Overall, the Duster is a mechanically sorted machine which is built to take the abuse that the Indian roads continually throw at vehicles without a regret. And while being at it, it feels composed, refined, and perfectly at ease in a very wide spectrum of scenarios. It’s great to drive, comfortable vehicle any day, and ticks all those parameters with its brilliance. For the price, it’s possibly the most well-rounded large-ish diesel SUV for families at this point. We’ll update this space with more observations as time passes by and the Duster piles on more miles on its odometer. If you have any questions or observations of your own, feel free to leave a comment below.